We are already a full week into the new year! And we’ve only had one official day of any sort of book learning as far as preschool is concerned. But we’ve gone on several outings where they’ve learned by experiencing first hand! That’s always my favorite, anyway! 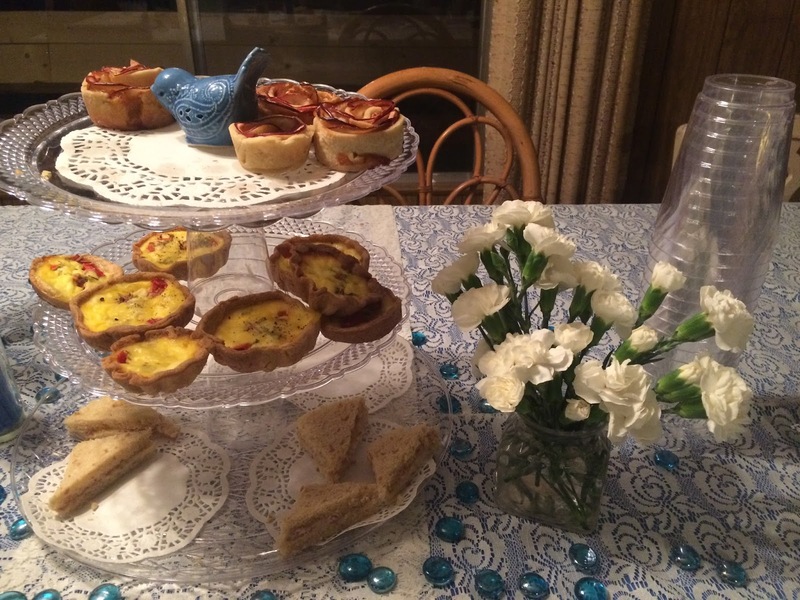 I scoured the thrift stores for old tea cups and saucers for a couple months. I love how they’re all unique and some of them are quite old and lovely! Most of them I was able to pick up for a dollar a piece. 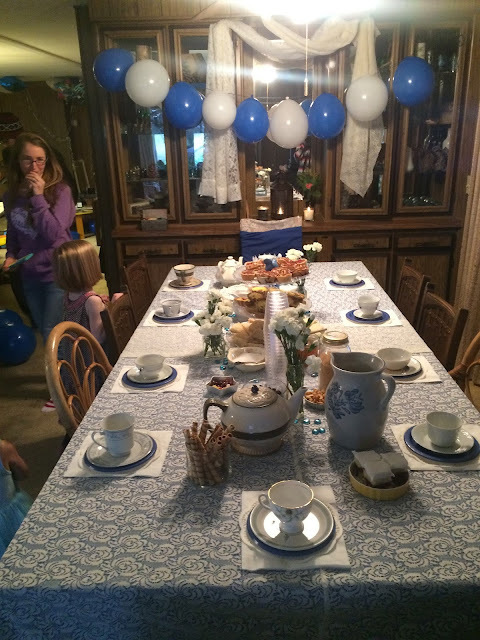 It’s possible I was a little crazy offering real china to six children under the age of 5, but they all did great with a little parental assistance! Blue is this little wildling’s signature color, so I worked it in as much as possible: blue and white balloons everywhere, blue tablecloth with lace overlay, chair cover, her clothes, and cakes and candies. I made a three tiered serving tray out of plastic ware from the dollar store and used doilies, paper plates, and napkins from there as well. As for the food, we had cucumber (delicious recipe here) and tuna sandwiches, tomato ricotta mini quiche, apple rose tarts, and pirouette biscuits. 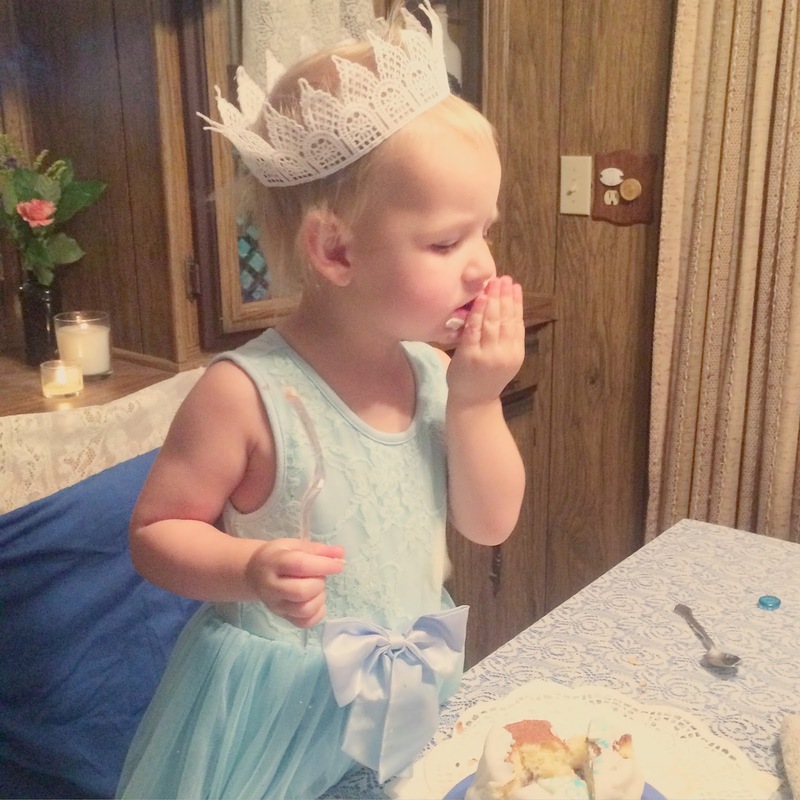 I attempted to make petit fours for her cake. Basically I made a white cake from this amazing recipe, cut tiny squares, doubled with a blueberry filling in the middle. 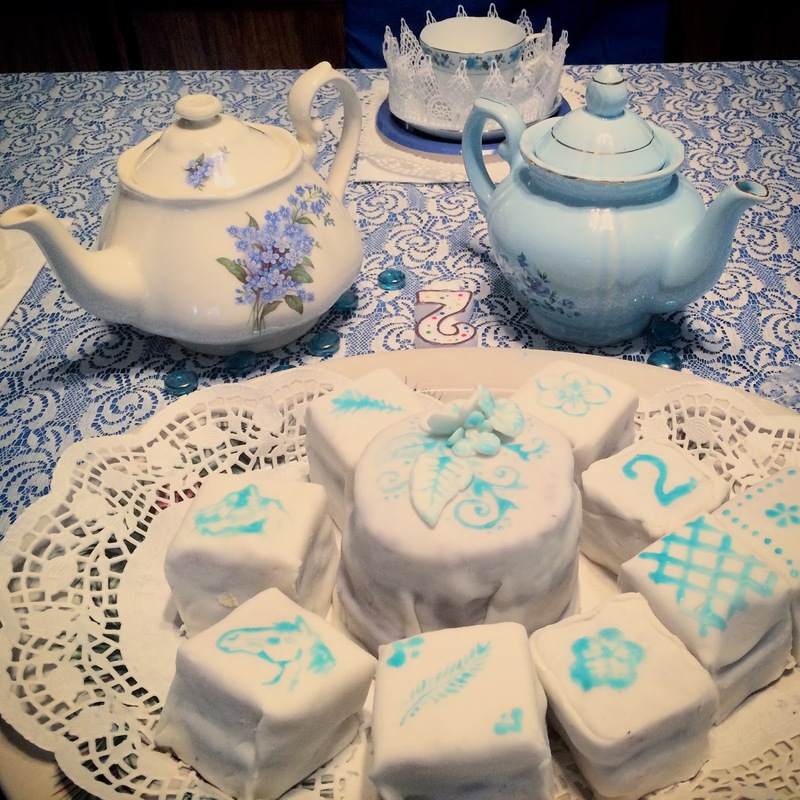 Then I covered with fondant and painted tiny pictures of her favorite things (horses, mountains, and flowers) in blue tinted sweetened condensed milk. I really love how they turned out! We had a couple activities including the Tea Bag Toss(throwing tea bags through a giant tea cup)! 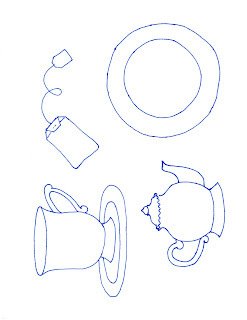 I also sketched out a tea set outline for the children to design their own china pattern. 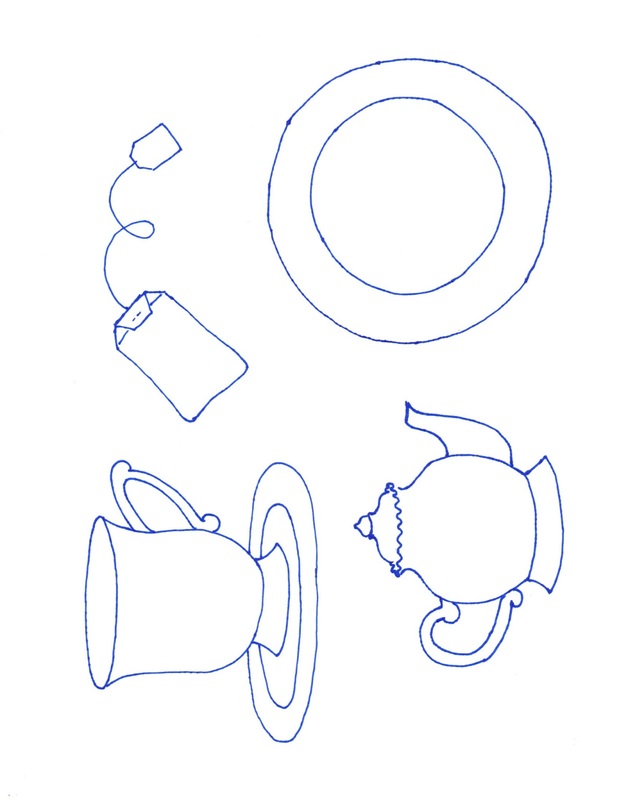 If you’d like to use this, the blank template is printable here! 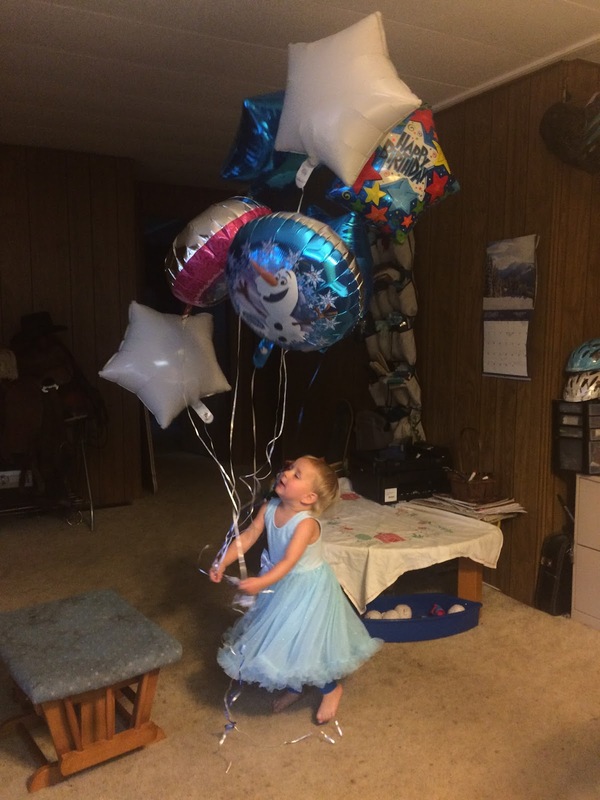 She ended up having the most wonderful time and continues to talk about it almost daily! It may not have been perfect, but it was inexpensive and memorable and I’m quite certain our little lady felt like a princess for the day!